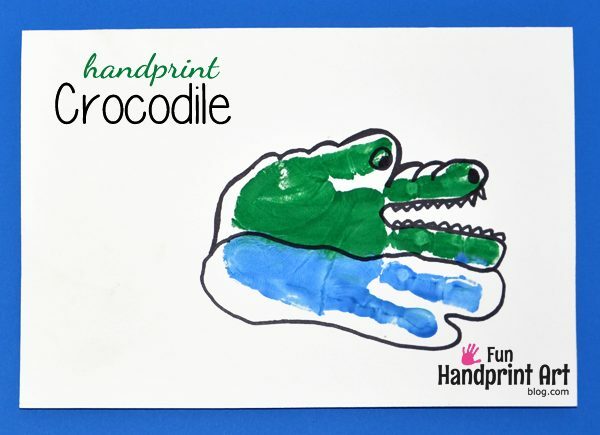 We made a handprint crocodile! It’s even swimming in water….tee, hee. It could also be an alligator craft instead. 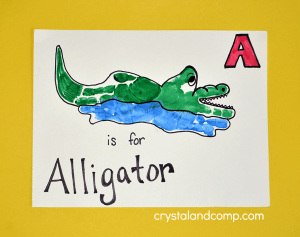 What’s the difference between an alligator and a crocodile? Alligators have a U-shaped nose whereas crocodiles have more of a V-shaped narrower nose making their jaw not quite as strong. Alligators are darker in color and all the teeth on the bottom are hidden when their mouths are closed. Crocodiles on the other hand, have teeth that interlock. The fourth tooth on the bottom (on each side) is larger and can be seen behind the nostril. Paint the middle finger, pointer finger, and thumb with green paint. Paint the pinky and ring finger with blue paint. Make a print on a sheet of paper keeping the thumb close to the pointer finger and leaving a small gap between the pointer and middle finger. These two fingers form the mouth area. When dry, outline the water and the crocodile head. Don’t forget to make the top part bumpy-looking! Add an eye, nostril, and lots of teeth. *This post contains Amazon affiliate links to the books mentioned in this post. Please see my full disclosure policy for more details. We read two books about crocodiles. The cuter of the two is Jake and the Never Land Pirates After a While, Crocodile. Captain Hook insists on finding the treasure in the scary Crocodile Creek which is where the Tick Tock Croc lives. Jake and his friends have to rescue him. Captain Hook is convinced that the Tick Tock Croc is following him. 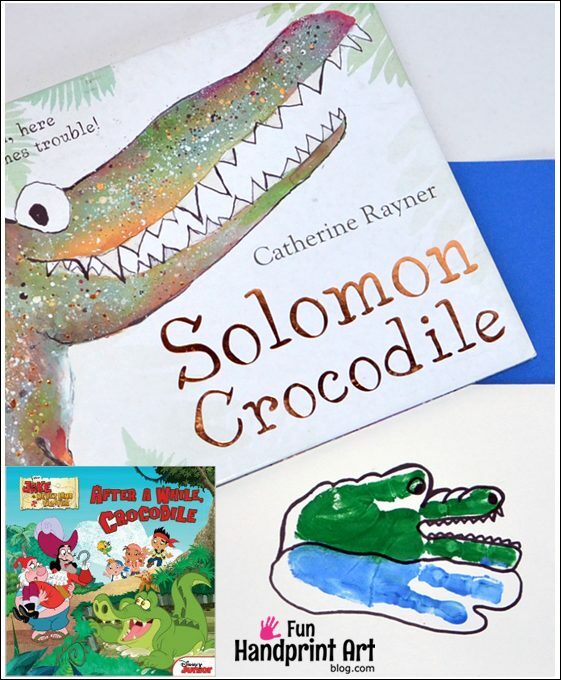 Solomon Crocodile is about a crocodile who just wants to play but everyone finds him to be a pest and sends him away. At the end of the story he finally finds someone to play with. 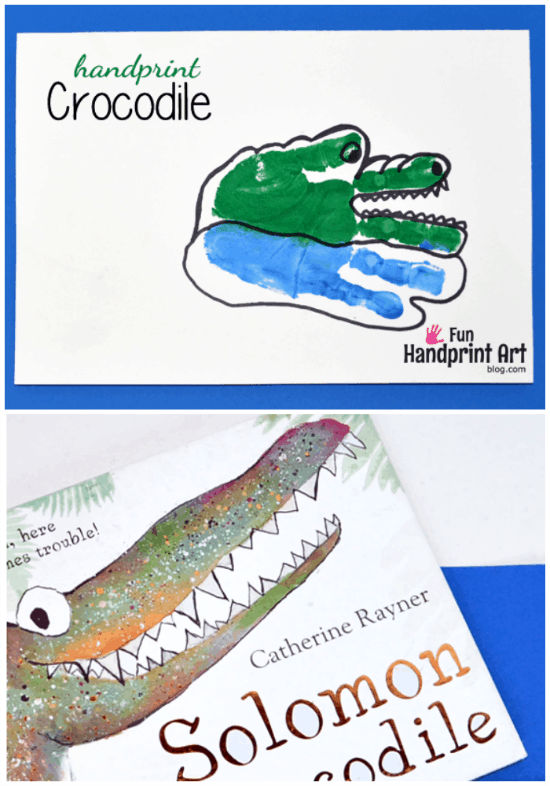 We also made a handprint alligator craft using 2 handprints! Head over to Crystal & Co. to see how we made it and while you’re there, check out the entire handprint alphabet series we are contributing over there.